Recent debates over proper amounts of liability auto insurance coverage in Wisconsin, Nevada and several other states have centered on how consumers’ pocketbooks may be affected by higher requirements. Opponents of raising limits have said doing so would push up average premiums to a point where it could restrict consumer choice and force some drivers to go uninsured. Supporters have said that higher minimums are necessary in order to accommodate rising health care prices and that the change has only a minimal effect on prices. Absent from many of these debates, though, are numbers quantifying the actual effects that coverage levels can have on premium sizes. But a recent study from the website OnlineAutoInsurance.com demystifies, to an extent, the pricing impact that increased levels of liability coverage can have. To do this, the site calculated rates using a single driver profile, five coverage scenarios and seven California car insurance companies. They found that triple-digit increases in liability coverage often brought about only double-digit price hikes. For example, the analysis showed that increasing total liability coverage by about 250 percent, from 15/30/5 to 50/100/25, would bring about an average premium increase of about 14 percent. This bump in liability levels is similar to the increase currently being debated in Nevada. In Wisconsin, lawmakers recently debated over whether to reduce minimum levels of insurance back to 2009 levels — bringing them from 50/100/15 back down to 25/50/10. Claims of how much the initial change had affected rates varied widely. One consumer group said overall prices had been impacted by less than 1 percent, while an opposing group said the number was closer to 33 percent. 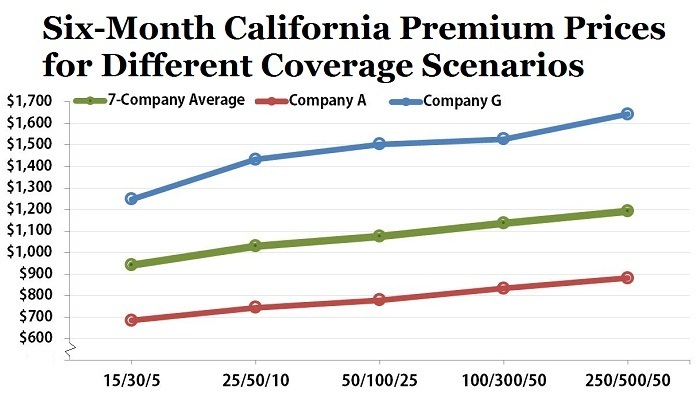 Although it should be noted that there certainly are differences in how insurers in different states price policies, the OAI analysis showed that going from around 50/100/15 down to 25/50/10 in California could amount to an average savings of approximately 4 percent. Another interesting point highlighted in the study is the fact that, for some insurance companies, premiums remain the same once a certain level of financial protection has been exceeded.